Michael Kors’s latest smartwatch, the Michael Kors Access Bradshaw, is a stunning luxury watch that looks premium. Like other luxury brands, such as Tag Heuer and Guess, MK has spared no expense with its latest product. Unlike the smartwatches from other tech brands, MK’s new wearable is more aesthetically pleasing. The company likely wanted to offer its customers a watch that they will actually want to wear all the time. However, this doesn’t necessarily mean that the watch cannot compete with other brands in terms of its overall functionality. At first glance, the MK Access Bradshaw looks absolutely luxurious. It looks identical to the original MK Bradshaw watch that it is based on. Of course, this isn’t necessarily a bad thing. Unlike its analog sibling, the MK access houses a lot of tech on the inside. Most people probably will not notice that it is a smartwatch unless they look closer. Compared to other smartwatches, the Access looks like a proper watch. All the materials used in building the watch are premium, which is evident in the watch’s heft. The chunky wearable device also boasts an IP67 certification, which means that it is water and dust resistant. The watch features the company’s signature MK-etched crown on the side, which functions as a button. Users also have the option of getting the all-stainless watch in different colors. Users can also opt to get different types of bracelets, which they can use for different occasions. 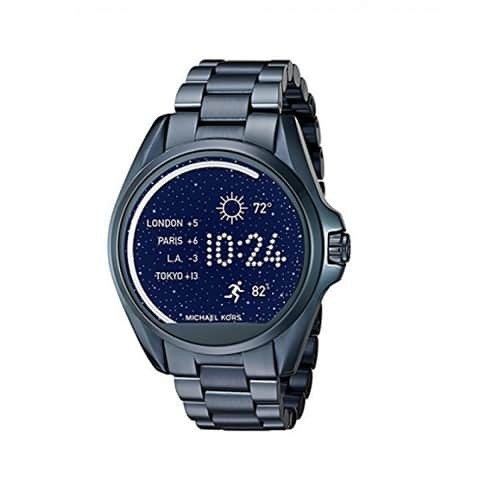 The Michael Kors Access Bradshaw sports a Qualcomm Snapdragon 2100 processors. The CPU, optimized primarily for smartwatches, runs Android Wear OS. Michael Kors has added a few custom touches to the operating system, including new watch faces that fit all types of situations. The watch also features 4GB of built-in storage, which users can use to upload their own music. This means that users can listen to their songs with their Bluetooth headsets without the need to pair the device with a smartphone. The watch features a 320 by 290 pixel TFT LCD display. The transflective touchscreen display is bright enough to view in direct sunlight. With the right watch face, the Access can even look like a regular MK watch. Unfortunately, MK had to make a few compromises with the Access to fit in the watch’s ambient light sensor. The display isn’t really round as there is a chin on the bottom, making it look like the Moto360. Because it is running Android Wear, the MK Access offers users a plethora of useful functionalities. Users can get their notifications directly on their wrist. This includes text messages, calls, emails, and social media alerts. Users can also download different apps from the Google Play Store. While the watch doesn’t have a built-in heart rate monitor, users can still use apps like Google Fit to track their steps. The watch doesn’t really have a lot to offer in terms of fitness functions. But, this really isn’t an issue given that the Access isn’t really a watch users will want to wear during their workouts. The Michael Kors Access Bradshaw is perfect for users who don’t necessarily want to look like they are wearing a high-tech device. Despite its discreet looks, the watch still sports many advanced features. MK fans who want to get a little more out of their watches will want to consider getting the Access Bradshaw, as it does offer the best of both worlds.